The advertisement was posted by a Campaign for Liberty blogger named Clayton Douglas. Douglas has a long history of publishing literature and podcasts advocating on behalf of the white supremacist, militia and sovereign citizen movements. (Read here.) Bloggers are required to apply for blogging privileges at the Campaign for Liberty website and post there at the discretion of the forum's administrators. The advertisement for Douglas' edition of the Protocols (which he sells for $25) has been posted at the Campaign for Liberty since 2008. That was not posted by the campaign: it was in the "Forum," where anyone can post. Perhaps it was posted by "Adam Holland." Contrary to what you write, the Campaign for Liberty requires bloggers to apply and register for blogging privileges. 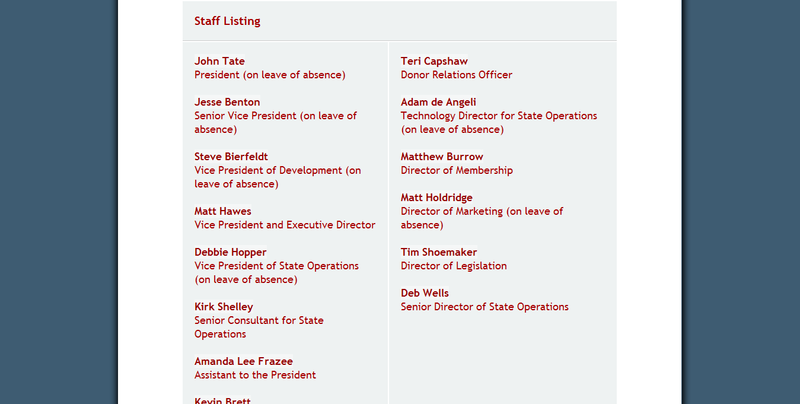 The forum's administrators are (obviously) able to delete offensive blog posts. Bloggers post there at the discretion of the forum administrators. To clarify your second point: you're implying that I posed as a militia leader in 2008 to get an account at Campaign for Liberty, posted the ad for the Protocols, then waited more than three years for just the right moment to right about it. Seriously, do you think that this is the best way to defend the Ron Paul campaign? The site has sort of moved (to a .org address), though they've left the old one (.com) up. 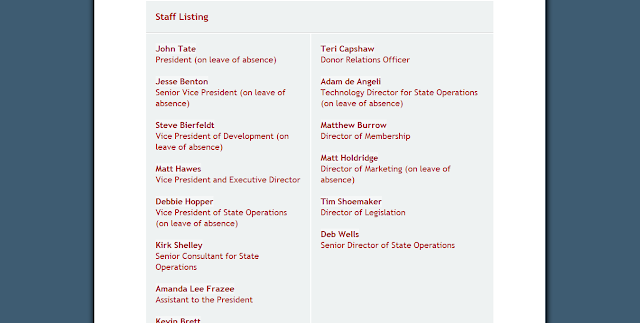 The new one lists different leadership (as is required for non-profit status, they couldn't have the same folks involved in Ron Paul's campaign, because they are required to not endorse politicians). If it's an "ad", is the person paying for it to be on the forum or have a prominent place on the forum? It's not a paid ad. 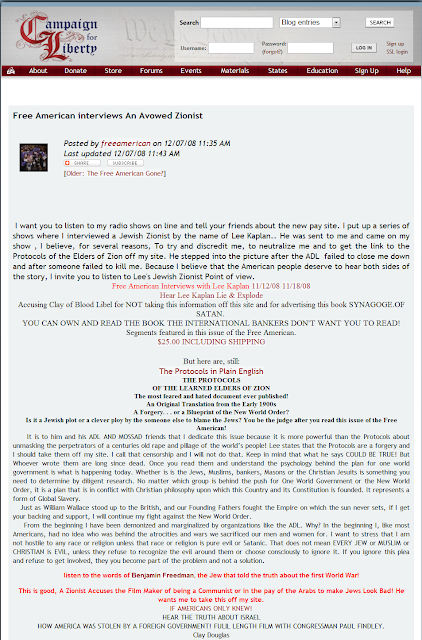 The blogger, Clayton Douglas, posted it to advertise this and one other book (called Synagogue of Satan), and subscriptions to a magazine he publishes. I just noticed a typo in my first comment. It should read "just the right moment to write about it". I'd like to add a few relevant words to the post. A persona named Jack Bernstein, apparently, wrote a book called "The Life of an American Jew in Racist Marxist Israel." I didn't get a chance to read the book, but it is cited and discussed by quite a few Holocaust denial and other related sites around the Web. According to them, Mr. Bernstein advances the claim that the Holocaust could have been prevented if Zionists had not cooperated with the Nazis, and if Zionists had not sabotaged the efforts of various countries around the world to accept Jews from Germany; and that it is not clear "whether the Holocaust happened as portrayed by the Zionist propagandists — at least not to the extent the Zionist claim." These aren't new or even original accusations. They are the bread and butter of Holocaust denial cliques and anti-Zionist groups. The rest of the usual tasteless dish is discussed in his book as well. All of this is, I guess, not new. What's new is a recent blog post at Campaginforliberty.org which describes the book and links to an online copy of it. The link is to an apparent full online copy of the book (which seems to be a very slim one) at a site that has been described as a "Safe Haven for Hate." (See this.) The post, among other things, notes that the book is a "barebones description of Zionism as it developed and has effected the world up to 1985," and states that the book "predicts ZioBanker strategy of Mideast War, engineered collapse of US Economy." I believe no further word is necessary. Is anybody afraid of the blueprint of the world that we live in? That's what the Protocols of the Elder of Zion is about. Read the book from cover to cover and look around and see how the world is shaped. You'll be surprised!! !